Bridgeway Recovery is a Patient-Centered Primary Care Home (PCPCH) which provides its services to teens, adolescents, and adults. The mission of Bridgeway Recovery is to offer integrated health care services to individuals affected by addiction, mental illnesses, or problem gambling. The center is one of its kind that provides addiction recovery, problem gambling treatment, mental health therapy, and primary medical care. The center offers holistic treatment to clients in a private and compassionate environment. Bridgeway Recovery offers residential, outpatient, and detoxification services to adolescents and adults. Through evidence-based therapies and treatment approaches, clients are enabled to make better choices for themselves to lead a healthy and happy life. Clients are offered education for managing addictions and taught tools to overcome their problems and adopt a healthier lifestyle that will contribute to their well being. The adolescent’s program provides integrated treatment services to teens for substance abuse, mental health issues, and co-occurring behavioral health disorders. Teenagers are empowered to realize their true potential and learn skills that encourage their physical, mental, and social well being. Clients are offered life skills education, relationship-based counseling, social engagement, and activity-based group interactions that help them leave their unhealthy behaviors and adopt healthier habits to live a sober life. 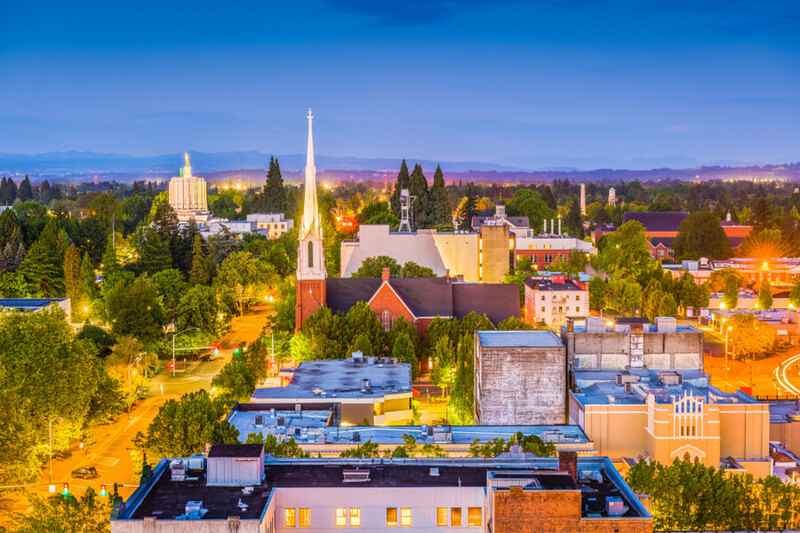 Bridgeway Recovery is located in Salem, Oregon as a comfortable house nestled in a private and serene neighborhood. The house can accommodate 8 men and 8 women at one time. Clients stay in gender-specific rooms shared between two of them. Each bedroom is furnished with twin beds, side tables, chest of drawers, and chairs for each client. The bedroom offers luxurious amenities and environment to its residents. Each room has an attached state-of-the-art bathroom. The bathrooms are spacious with two sinks and a shower. There are two living areas inside the house. The living rooms are beautifully furnished with comfortable sofas and a rocking chair. There is a fireplace in the living room along with a flat-screen TV where residents can relax and socialize in the free time. The living rooms are also luxuriously decorated and equipped to make the clients’ stay as comfortable as possible. There is a fully equipped kitchen in the house where a trained chef and dietician prepare healthy and nutritious meals for residents. Residents are provided with a well-balanced and delicious meal three times a day. All residents eat together in the dining area adjoining the living room. Special dietary restrictions of residents are also considered during the preparation of meals. Outpatient Program for Co-Occurring Disorders. Bridgeway Recovery offers inpatient and outpatient treatment services to adolescents and adults for substance abuse and behavioral health disorders. The center offers individualized treatment plans for each client which determines the exact cost that they have to pay. The approximate cost of treatment for 30 days of the residential program is $7,500. The center works with certain insurance providers and accepts their plans as reimbursement for the treatment costs. All financial information could be acquired from the admissions office where the staff members help clients and their families by answering all financial queries and helping them find the most affordable option. Bridgeway Recovery is a behavioral healthcare center that offers treatment services for adolescents and adults for alcohol and drug addiction, substance abuse, behavioral health disorders, co-occurring mental health disorders, and problem gambling. The center is a certified primary care provider that takes care of all health needs of clients. The center employs holistic treatment approaches that help clients and offer them the freedom to recover. The staff at the center comprises highly trained and experienced healthcare professionals who offer quality services to clients. Clients are offered historically-proven and evidence-based therapies which empower them to become the better version of themselves. Clients are able to adopt healthy habits which help them break the bonds of addiction. Through the various residential and outpatient programs, they are empowered to achieve lasting recovery and sustain it through the support offered at the aftercare programs at Bridgeway Recovery. Bridgeway Recovery Center has been successfully offering quality integrated treatment services for substance abuse, behavioral health disorders, and problem gambling since its inception. The staff at the center is primarily responsible for the success with which Bridgeway is able to help clients recover from their issues. The multidisciplinary staff at the center is highly qualified, trained, and experienced in their respective fields. They offer round-the-clock services to clients to help them in their hour of need. They are able to empathize with the clients through compassion, love, and respect which enables clients to trust them with the feelings and fears. The staff provides guidance and direction to clients to help them achieve lasting and sustained recovery. The staff at the center comprises doctors and nurses who supervise the detox programs. Other staff members include Licensed Professional Counselors (LPCs), Addiction Treatment Specialists, Therapists, Counselors, Licensed Nurse Practitioners, Social Workers, Licensed Clinical Social Workers, Clinicians, and other members.